Easter Island is located about 2,300 miles from Chile’s coast and 2,500 miles east of Tahiti. It covers roughly 64 square miles in the South Pacific Ocean. It is one of the most remote communities in the world with the closest continental land being Chile at a distance of 3,700km. Easter Island has always been a top attraction for those who love historical mysteries because of the Moai statues scattered all over the island. They were carved by between 1250 CE and 1500 CE Rapa Nui people. Easter Island is named after the Dutch explorer who first landed here. The first known European visitor to Easter Island was the Dutch explorer Jacob Roggeveen, who arrived in 1722. Nobody knows how these huge Moai statues were moved. After testing several theories it is concluded that islanders used a combination of log rollers, ropes and wooden sledges. These statues are incredibly tall. The tallest complete statue that has been unearthed in 33 feet tall and weighs an incredible 82 tons. All the statues have truncated necks making the jaw line stand out. 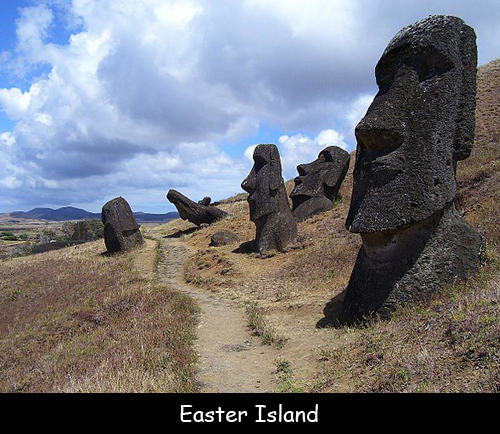 In 1888, Easter Island became a special territory of Chile. There are a total of 887 massive Moai statues on this island. The island is 24.6 km long and 12.3 km at its widest point. The total area size is 163.6 square km. The tallest point of this island is the volcanic peak of Terevaka measuring 1,663 feet high. Initially, the Moai statues were believed to have just heads but when archaeologists decided to dig they found that these statues have torsos as well.